In ceiling speakers can be the difference between a good sound system, and a great one. In order to get the best in ceiling speakers for you, there are a few different things you should take into consideration. Whilst I do like a traditional set of speakers, there is something attractive about having your speakers subtly placed throughout the ceiling and walls of your house. The right set of speakers can be as effective, if not better than the traditional ones you might be used to. And, you have the added bonus of them not clogging up your lounge or taking up precious space in your bedroom. If you’re looking to improve the listening experience in your home, you’re in the right place. Editor’s Note – Are Ceiling Speakers Actually Any Good? Can I use in wall speakers in my ceiling? What is the difference between a two-way and a three-way system? Do I need a three-way sound system, then? What does directional speakers mean? How many in ceiling speakers does my room need? Before you choose your in ceiling speakers, you’ll want to consider which brand and warranty will suit you best. Of course, going with a reputable brand like Polk or Klipsch will ensure that you won’t need to worry about your speakers breaking, which can be a concern for many. I won’t recommend any speakers here that I haven’t personally used or thoroughly investigated myself. If you have read any of my other posts on the website, then you’ll know one thing; I love Polk. 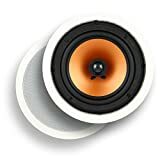 I’ve used their products in many of my projects already, and I actually use these speakers in my own home so I have little trouble recommending them to you guys. If there’s one thing that I like about the RC80i’s, it is the high quality material that they are made from This separates these speaker from the competition. The cone is a mineral-filed polymer composite, and the surround is made from rubber. This is a nice surprise, as many in ceiling speakers use foam for the surround,which doesn’t have the longevity that rubber does. You can swivel the tweeter to any 15 degree angle, which is good if you want to specifically target an area of the room or if you have an awkward angle for where you want to install your in ceiling speaker. This is great, and increases the clarity that you’ll get throughout your home, which is of utmost importance. By using high quality materials to put these speakers together, Polk have produced probably the best in ceiling speakers that you” be able to find on the market within it’s price range. Top quality materials used help to create some of the clearest quality sounds you’ll find at all frequencies. 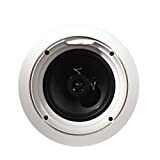 Unlike some other ceiling speakers, these don’t struggle to deal with lower frequencies and are capable of producing some pretty comprehensive bass. The warranty that you get from Polk is very comprehensive. I’ve returned products to them in the past with no trouble whatsoever. You don’t need a room full of these speakers to get a good sound; two or four of these would be ideal With some less powerful speakers, you’ll need 6 or more to get a decent sound flowing through your household. For speakers that are of such high quality in general, I wish they’d have put a bit more effort into the grill. It’s pretty flimsy, and you have to be ultra careful if removing the grill for any reason. The templates are kinda small, so you might need to do some improvising if you’re install these in ceiling speakers yourself. personally though, I would advise you get someone else to install them unless you have some prior experience with install audio equipment. Scattered 4 of these around your ceiling and you’ll have a great cinema experience. Polk speakers are the best. Pyle produce some of the better quality budget speakers, finding a pretty good line between cost efficiency and creating a quality speaker. You don’t want to cut corners too much and go for the very cheapest speakers, otherwise you’ll end up with a terrible sound that might not do the other speakers in your system justice. With a 1 inch titanium dome tweeter, you can be sure that you’ll get some good, responsive sounds when playing things at a higher frequency. 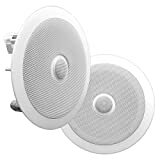 This is especially important for watching movies, as the quality of the dialogue that you’ll get from these ceiling speakers is particularly impressive. 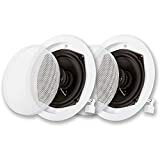 Available in both a 6.5 inch and 8 inch setup, this pair of in ceiling speakers is a great option for those who don’t want to break the bank. They’re 125 watt (each) speakers, which should be sufficient for the majority of people; my rule is not to get anything less than 100, just incase you do need that extra power at some point. 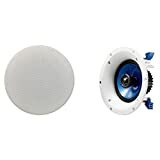 For the best performance for any in ceiling speakers, you’ll want to use them as part of a set up with some in wall speakers and a good in wall subwoofer. Price-wise, I don’t think that you can get much better than these without increasing your budget substantially. I’d be surprised if you could find better speakers at a cheaper price than this. They’re really easy to install, and the manual is pretty clear if you’re new to audio equipment. As two way speaker systems go, they produce some good quality high and mid-range frequencies. Usually with speakers, this is the most common complaint in terms of sounds, as unlike a three way system, there’s only one tweeter. If you don’t understand the difference between a two-way and a three-way system, click here. This might just be me being a bit picky, but I actually think that this set up is pretty ugly. I know, they’re in wall ceiling speakers; you can’t see the majority of them. But people will notice ceiling speakers pretty quickly if they walk into a room, as they’re not something that’s common in every household. Specifically, the grills on this set aren’t particularly attractive, in my opinion. Whilst the high frequencies are great, I don’t think the woofer is as good as it should be. It can struggle with lower frequencies, which isn’t something I’d expect of any of my speakers. If you are on a tight budget, then you’ll struggle to find a better option than the PDIC60T. Why get one in ceiling speaker when you can get five, right? Whilst they might not be the very best quality, you could do a lot worse than this five-set from Acoustic Audio. These subtle speakers would be a good addition if you’re trying not to overpower the room with sound and want a speaker that will go unnoticed. A couple of things that I like about these speakers. Firstly, they use soft dome tweeters, which is something that I particularly like as opposed to titanium. Secondly, they don’t cut too many corners, and use rubber surrounds when many cheaper speakers won’t spend the same amount on production quality. Although to be honest the quality is lacking a little bit; for example, they use polypropylene cones (which is technical term for plastic, in case you’re wondering) which I don’t particularly like, this does enable them to produce the speakers at an absurdly low price. As with anything, you kind of get what you pay for. So if you’re after a cheap budget option, then these speakers would be a good option. With this option, you’re getting 5 in-ceiling speakers for what you might pay for just one elsewhere. So if you don’t have a massive budget, or you want to set up your whole house with speakers, then you could go with these from Acoustic Audio. They are relatively small and compact, which means that you can use them without worrying about whether they will destroy the ambience and color scheme of your home. They wuld actually be ideal for use in a small business like a coffee shop or restaurant, where a nice level of music is played and they can subtly fit into the interior design. If you set these up with a good subwoofer, you’ll get a pretty good quality of sound rippling throughout your household. I do think that these speakers don’t have the high quality sound of other speakers, though they are significantly lower in price. If you have the budget, you could consider going for something of a higher quality, but these will do fine if you don’t want the very top end speakers. They only go up to 25 watts per speaker, so if you like pumping music throughout your entire house, then you really will need to look at a more powerful option. Are they good for a basic television system that you’ll watch on medium volume? Yes, they’re great. Are they good for fast paced action movies and music with heavy bass? Most certainly not. Whilst I don’t advise scrimping on speakers, this five-set is good for anyone looking to pick up a cheaper option. A common question that I’m asked by my friends and family in regards to ceiling speakers; is it really necessary? Well, it’s actually a much debated thing in the audio industry whether it’s even worth putting ceiling speakers in. Many audiophiles will argue with you that ceiling speakers are just a waste of time. I however, tend to disagree with them; ceiling speakers can make up an integral part of a great sound unit. Whilst I wouldn’t get just in ceiling speakers on their own, if you match them up with some top quality in wall speakers and a good subwoofer, you’ll be well on your way to having a comprehensive sound experience. Although most speakers are two way speakers nowadays, I had to pick a decent three way speaker for those who love their mid-range frequencies to be on point. You won’t find any better than the Yamaha NS-IW280CWH. If you are wondering what the difference is between a two way and a three way system, essentially it is just that the three way system had an additional tweeter to deal with the mid-range frequencies. I go into a bit more detail here. With a solid tweeter that is easy to swivel, you won’t have any difficulty directing the speaker if you aren’t happy with the dispersion area that you’re currently filling. What separates this speaker from the others? Well, it uses SoundMax technology. SoundMax is a Taiwanese company who have specialized in audio and computing for many years, and in fact you’ve probably used some of their technology unknowingly already. They produce high quality goods and they have a really great track record, so you won’t need to worry about your speakers breaking. They’re actually available in both a 100 watt and 120 watt variation. Although we’d advise you to get the 120 watt if you like loud music, they are significantly more expensive so bear that in mind. They have swivel tweeters, which means that they’re able to disperse sound around your house easily and volume will carry itself. They are available at a pretty reasonable price. Don’t forget that these speakers come in pairs, not individually. You’ll probably be best off ordering 4 or 6 of these ceiling speakers for the best effect. They pair up beautifully with a good subwoofer. They aren’t as good with low frequencies as some of the other in ceiling speakers that I’ve listed here. In general, ceiling speakers aren’t designed to deal with deeper sounds and are better at carrying the sound through a room. Though in an ideal world, they would do both. Klipsch are another of my favorite companies around, though their products do tend to run at a slightly higher price than what I’d like to invest. If you have the extra cash to invest in better quality, then I’d advise you have a look at the R-1650-C as an option for your in ceiling speakers. They’re really easy to install, although you might have a few issues getting the screws in properly as this isn’t particularly easy. There’s only five screws, but they are very difficult to get in properly, so be prepared for a bit of a struggle! There’s great debate about what the best materials you can use to make your speaker are. Often, a lot of the cheaper brands with use plastic as opposed to metal and a variety of other materials. Although these speakers are made from polymer, they aren’t lacking in quality and they’re actually pretty well-made. It’s all about the manufacturing in my opinion, less so of the materials. If you’re wondering, the mesh cover is also paintable, though I personally don’t like doing that and prefer to leave all of my speakers as they naturally appear. The grills for the R-1650-C are undoubtedly the best you’ll find. I’ve found more often that not, companies put a lot of effort into the design and audio of the speaker, only to use cheap material grills which ruin the speakers whole aesthetic. This isn’t true for the R-1650-C, which has nice looking and durable aluminium grills that you won’t need to worry about bending out of shape. They’re moisture resistant, which means you can use them anywhere throughout your house. Ever wondered about having a full blown karaoke set-up in your bathroom? Well, you can install these speakers in your bathroom pretty easily and don’t need to worry about the moisture destroying them. Directional tweeters are handy for those who want to aim their sound in a specific way. I mean, this setup is kind of expensive seeing as you’ll more than likely need to get at least 4 of these. You could get two for just your bedroom, but four would be more advisable and six would be ideal. Klipsch is known for being the higher-end quality of these types of cheaper audio products, so don’t expect to be finding any bargains. Honestly, there’s not much else that I can find wrong with these speakers; if you have the budget, I’d advise you to go ahead and test these out, you won’t be disappointed. High performance speakers at a reasonable price. The M-8C makes up a full sound system from Micca, along with the M8-S which is a great choice as a center channel speaker. Whilst Micca isn’t usually my first choice when installing speakers in my own house, I certainly wouldn’t be averse to using their speakers in any setup. They produce some great quality products, and the M-8C is a good example of that. I would say that they’re the direct competitors to the RC80i’s and are extremely similar, and there isn’t much between the two. Like usual, I like the 1 inch soft dome tweeter that you’ll get in these M-8C’s. They just produce some pretty awesome sounds, and if there’s one thing that gets on my nerves, it’s distortion; you won’t get any of that with these. Although it’s common for ceiling speakers to struggle with bass, that isn’t a concern with the M-8C’s due to a 8 inch poly woofer that’s built for high excursion. One thing that tends to confuse people in a technical sense is the term crossover. For example, the M-8C’s are advertised as having a 6 decibel crossover network, but if you’re not familiar with these terms, it can be kind of confusing to understand what’s meant by this. If you want to understand more about crossovers, click here. I do like the design of the M-8C’s, especially if you are looking to match them with other Micca products and complete a whole room with them. You won’t find many better products within this price range, I assure you. The M-8C’s are really stylish in comparison to some of the other in ceiling speakers. There isn’t a great deal you can do with the grills of a speaker, but they do look very good. From a price perspective, they are available at a really good price. They’re always in comparison with the Polk Audio speakers, of which they’re a tad bit cheaper at the time of writing. Although I prefer hard dome tweeters, the silk dome tweeter that the M-8C’s uses produce a really great quality sound. The sound quality that these produce could be better, especially at higher frequencies. In ceiling speakers aren’t designed to deal with lower frequencies, but these do a pretty good job at that. It’s the mid-range frequencies where they tend to struggle, which is unusual for smaller speakers like these. Due to their relatively low power, you’ll want at least 4 or 6 of these speakers to get full effect. This can out the price up a little bit, which isn’t ideal. Set a few of these up with the M-8S and a good subwoofer and you’ll have a complete sound system that you’ll be proud to show your friends. Remove the grill and the cover off the front of the speaker. To do this, there should be a small tool included to help hook the front grill of your speaker off. If not, use a knife or screwdriver and edge it around the surface, in the same way you would open a tin of paint. Place your template on the ceiling, and carefully draw the template onto the ceiling. Use the box cutter, or a regular blade, to etch around the edges of the circular template. Doing this will make it much easier when using your keyhole saw to cut out the drywall. Get your keyhole saw, and slowly cut around the template. This will cause a significant amount of mess, so you might want to wear some goggles and lay some sheets down if you don’t want to destroy your carpet. Check if your speaker fits comfortably in the hole cut. Hopefully, it should fit perfectly into the hole that you have cut for your speaker. Wiring is probably the hardest part of this whole process; you need to make sure that you put your positive and your negative in the right places. If your speaker fits, slowly connect the wires to the speaker. Insert the speaker, and use the four screws that are situated in the speaker into the wall. Before I place the speaker in, I’d advise that you clean up any dust situated in the wall and line the edge of the whole with masking tape. This way, you minimize the chance of any vibrations forcing any dust into the speaker. That should be about it! Before you replace the cover and grill, you can aim the tweeter in any way that you would like. It’s not always easy to understand some of the more complex terms that are used within the audio industry if you’re not an audiophile yourself. I’d advise you to check out the website a bit more, as I do try and answer a few questions on every post. Here are five of the most common questions I get asked when regarding in ceiling speakers. Usually, all surround speakers like in wall and in ceiling speakers are the same. There may be the odd occasion where some speakers are specifically designed to work better in your ceiling, but the majority of the time both types of speakers are interchangeable. In a two-way system, you would have a tweeter and a woofer. The woofer deals with anything low frequency, usually below 2000Hz (a subwoofer would deal with anything below 200Hz, if you’re wondering). The tweeter deals with anything above this, or any high frequency sounds. For example, the flute would be played through the tweeter, whereas a tuba would be played through a woofer. Simple, right? But what about anything in-between? Well, this is what a three-way system was designed for. It introduces a mid-range driver, that is designed to deal with anything between the high and low frequencies. No, more than likely not. Just because it’s a three-way system, it doesn’t necessarily mean that you’re going to get a better sound. In fact in my experience, at lower budgets I get just as good, if not better sound quality out of my two-way systems. Usually, this question is asked about directional speakers, sometimes referred to as angled speakers. It essentially refers to the tweeter, which can be directed or angle in a certain way to aim the flow of sound coming out of the speaker in a different way. This is what is meant by a 15 degree swivel tweeter; the tweeter can be directed in a specific way to flow sound in that direction. Although there’s no hard and fast rule to this, you’ll usually need at last a pair of in ceiling speakers in your home. It does depend on what other speakers you have; for example, if you have a good subwoofer and a pair of in wall speakers, you might only need two in ceiling speakers to complete your setup. However if you have less speakers, or if you’re doing this for a particularly large room, then you will probably need 4 or 6 speakers. All in all, these are just a few of my favorite ceiling speakers that you’ll want to think about if you’re looking for high quality performance in your house.